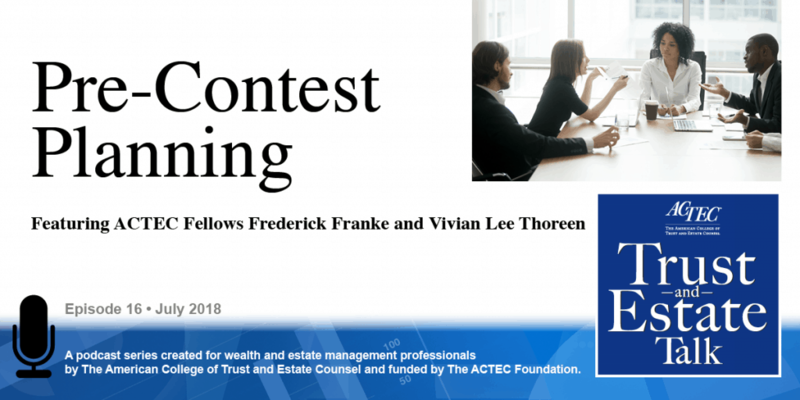 “Pre-Contest Planning.” That’s the subject of today’s ACTEC Trust and Estate Talk. This is Margaret Van Houten, ACTEC Fellow from Des Moines, Iowa. There are many techniques that may discourage challenges to your client’s estate-planning documents, including steps the planner should take or avoid taking to assure that the client’s wishes have a better chance of surviving than the deceased client did. 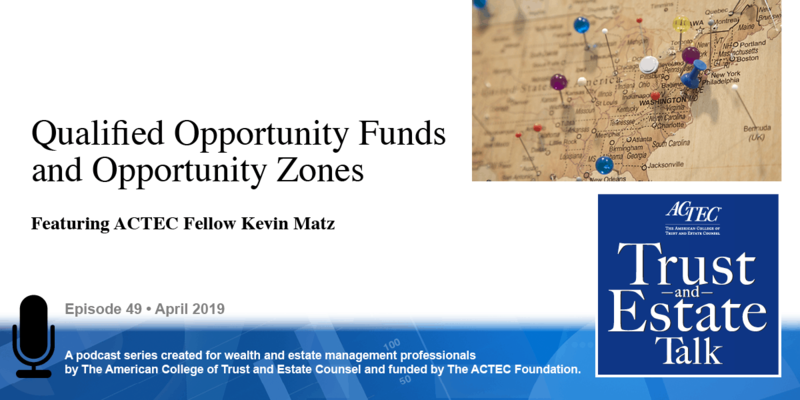 To learn more about this topic you will be hearing today from ACTEC Fellows Fred Franke of Annapolis, Maryland and Vivian Lee Thoreen of Los Angeles. Welcome to you both. Thank you. So, the first topic we’re going to talk about are engagement letters. It’s critically important to have them, and really the two key questions that need to be addressed and will be addressed in our program are these: First, who is the client? This is closer to a trick question than it sounds given our practice area since our clients wear so many different hats, fiduciary and otherwise. The second is: What is the scope of the representation? It’s important to specify what the scope will be, again to avoid any misunderstandings down the road and really not to be afraid to define the scope of our representation in one sentence. Other things to consider are to ensure that you’ve addressed any potential conflicts of interest, payment arrangements, including whether or not you’d like a retainer, and how you will get out of the representation if it’s not working out. If there’s a challenge after the client dies, the first line of defense, really, is the scrivener, the lawyer that prepared the documents, and so it’s very important that the lawyer who prepared the documents has a good recollection of all the elements that would fend off an attack. But the reality is, you may not know if there’s going to be an attack or not, so the best defense is to really follow best practices in all matters and maybe use them in a little more detail or a little heightened awareness if you believe there is going to be an attack. There are some indications of when an attack of the plan may happen. For example, if a client wants to skip over certain family members or favor other family members or even not give anything to any family members but give it to a third party, that’s obviously a recipe that there’s going to be an attack. The two main challenges to documents is either on the basis of capacity or on the basis of undue influence. I have never seen them in any case where both of those haven’t been pled, although they bleed together, they’re very different grounds. Testamentary capacity is the client has to know the general nature of the assets. The client has to know who the “natural objects of his or her bounty are” and also has to know how the plan works together. So, those elements should be in detail put in the attorney’s notes, and those notes should be contemporaneous with the meeting, and the meeting ought to be without anyone else in the room. Another topic we will cover in our program is whether or not and what kind of mental evaluation to have for our client. Some issues to consider before hiring an expert in moving forward with that evaluation are these: First, what is the purpose of the evaluation? Why are you considering having an evaluation? 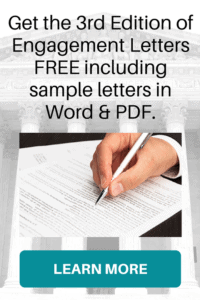 Is it to assess the client’s capacity to execute an estate planning document? Is it to assess their susceptibility to undue influence, or possibly both? Second, how formal is the evaluation going to be? Is this an evaluation that you anticipate will be documented? Is it something that will provide a gut check to you as the practitioner? Another component is the timing. The timing is critical, because ideally, you would want to have the evaluation on the same date as the execution ceremony, and the longer the time apart, the greater the likelihood of decline or a change in the mental status, which will basically negate the value of the evaluation. And finally, a consideration is: Who is going to conduct the evaluation? One thing to consider is whether or not you’re going to have the client’s primary care physician or whether you’re going to have a specialist such as a neurologist or geriatric psychiatrist, and there are factors that suggest one or the other or both in some instances. Another topic we’ll cover in our program is drafting the estate plan. How to most effectively shield against attack and the primary thing we advise is, obviously, to get as much information about the client’s assets, liabilities, and prior estate planning documents so that you have as much information as possible going forward. And given that our program contemplates litigation over the client’s estate-planning documents, a couple of ideas for basically bomb-proofing it is: Consider having the client execute serial documents, which is to have the client sign a series of testamentary instruments over a period of time, which would force the contestant to face an expensive, uphill, and long-term battle to set aside multiple documents over a period of time. Another aspect we cover is whether to prepare amendments or restatements. 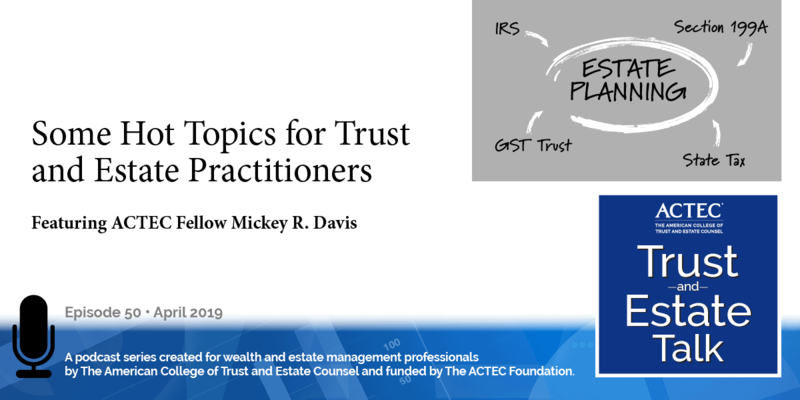 In this day and age, given technology and the ease with which we can prepare estate-planning documents, there are few reasons to prepare amendments versus restatements, but we go through that in more detail. Finally, when we’re talking about documents, it’s really important to retain superseded or older estate planning documents for a number of reasons. One, they are evidence. 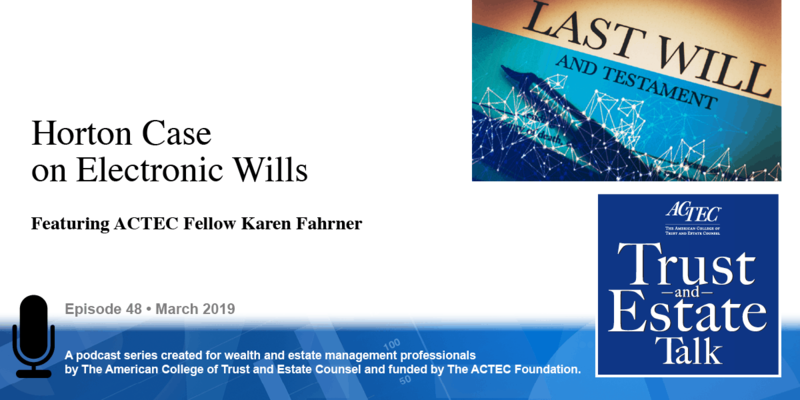 Two, it will absolutely affect your ability to recall and testify as to why the client wanted certain changes or not, and it will help inform the client’s past estate-planning intentions. The other bomb-proofing mechanism is to put an in terrorem clause in, or it’s also called a non-contest clause, and the purpose of that, really, is to frighten or terrorize any beneficiary from attacking the plan. And to do that you have to be leaving this person a substantial amount of money that they would forfeit if they contested the plan – which sometimes is repugnant to clients because they really want to cut this person out. At common law, these forfeiture provisions were the norm. That was the baseline. And there are a few states that still follow that. Most jurisdictions, however, follow the Uniform Probate Code model and that one says that they – these in terrorem clauses – are not enforceable if there’s probable cause for the challenge. And the probable cause is a phrase used more currently in the criminal defense world, but it means that you have a high likelihood of prevailing once the facts are known, but you have to have this probable cause at the moment that you file the suit which presents real problems. In Maryland, for example, you must file suit within six months of the will being probated, which means that you have to sort of know what’s happening with the document well before you get into discovery. So there’s some problems with probable cause, but generally they are enforced, unless there is the probable cause. The other way in the trust field, sort of in the merging way of tamping down challenges, is to not let the beneficiary have direct access to all of the information of the trust and what one does – and this has to be by statute – is that there’s a surrogate who receives the notices – the information from the trust. This gets very close to violating the basic rules of trust, which are enforceable and equity, but we’ll see how they shake out as there’s litigation on it. The other aspect of a client’s estate-planning document and how to shield against attack is the execution ceremony. It’s really important to have consistency and thoroughness when it comes to this particular aspect of the client’s estate plan and there’s a lot that an attorney can do to ensure that it is done concisely, consistently, and correctly. The attorney’s role is to make sure that supervising the execution and making preparations to make sure it is as smooth and uneventful as possible. What’s important with the execution ceremony is to select good witnesses. That doesn’t mean selecting the client’s friends; it could be others. The timing of the execution of documents is really important; we talked about the medical evaluation early on, so we’d want to coordinate that as well as with a date and time when the client is going to be at their best. The final aspect we talk about when talking about an execution ceremony is whether or not to videotape, and there is so much controversy over this topic, so we’re obviously not going to get into it here but we need to consider a few things before you videotape which is: What’s the purpose? Why are you going to do it? Is it going to be admissible? Will it do more harm than good? Who’s going to be entrusted with custody of the videotape, and how will that person ensure that it’s maintained properly? And finally, what, if any, are the alternatives to videotaping? And eight jurisdictions have a pre-mortem probate process where you don’t have to wait for the client to die, but you can go into the court during their lifetime and probate the validity of the will. And it has some of the same problems that Vivian talked about in the videotaping is that it’s done sort of late in life, you’re having sort of a potentially toxic, very emotional hearing with the senior member of the family, and the senior member of the family may not come off very well. As I’ve said there’s eight jurisdictions. It really hasn’t spread to the other states. I think the jury is still out whether this is an effective way of avoiding contest. Fred and Vivian, thank you very much for teaching us about pre-contest planning.